442, Lot: 463. Closing Apr 17, 2019 at 12:34:20 PM ET. Gallienus. AD 253-268. 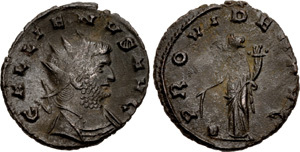 Antoninianus (19.5mm, 2.72 g, 11h). Siscia mint. Issue 1, AD 262-3.